U Shaped desks maximize your work & storage space, in style and in comfort. 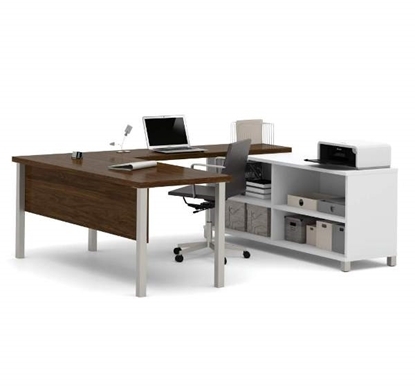 This Offices To Go U shaped desk with storage drawers features superior laminate construction, contemporary style, and a strong and durable 3mm PVC "Super Edge". Includes a "D" island work surface. Features drawers with smooth rolling ball bearing drawer slides. Eco friendly GreenGuard® certified. Free shipping and warranty available on all office furniture. 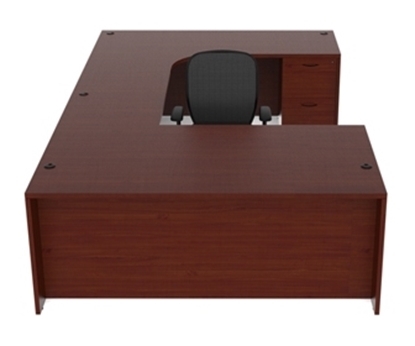 From our very popular OTG series, this U-shaped desk provides function and space at an affordable price. This durable U-shaped desk features two hanging pedestals with one file and one box drawer each and ball bearing suspensions. 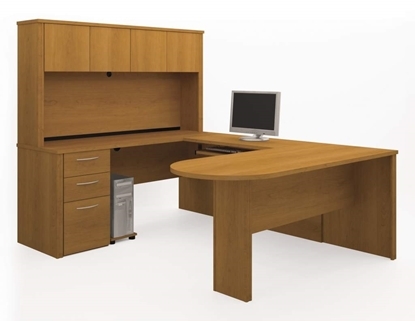 The reversible Bestar Innova U shaped desk with hutch is one of our most popular desks. It offers style and function for an affordable price and works well in a home office as well as a business. The Innova Series looks great in a extra bedroom in your home. Free shipping and warranty available on all discount desks. A great choice for the home or the office. This U-shaped desk includes two hanging pedestals for all your storage needs, grommet holes for wire management, and a durable 1' thick construction. This item is available in 5 finishes with corresponding drawer pulls. This Bestar Connexion U shaped desk is both attractive, with its modern design features, and functional. The main desk has a bow front top that provides more work surface space and it offers a conveniently placed lateral file that maximizes storage. 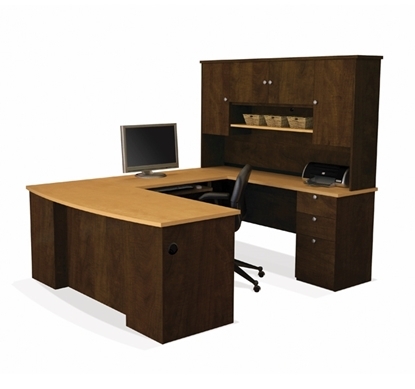 With a durable edge and stain resistant top, makes this a good choice for your home office or commercial environment. A great addition to any home office or commercial office. This U-shaped desk features open end panels to give you a spacious feel while you work and has a single pedestal for all of your storage needs. This desk is available in 4 colors and have grommet cut outs for all your wiring needs. The Amber U shaped desk from our large collection from Cherryman. Features a 1" thick top with a profiled edge on all four sides and is available in (5) stylish colors. The Amber also includes an oversized filing cabinet and peninsula top design. Free shipping available on all discount office desks. A great addition to your commercial office or home office. This U-Shaped Desk is available in 4 colors and features a metal frame, a single pedestal for all your storage needs, and open end panels to make your office feel spacious. 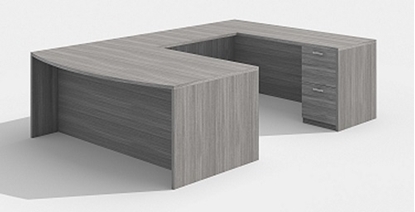 This U shaped executive desk provides the image you want to project in a very attractive, contemporary package. There is plenty of work surface space and ample storage. Manufactured from high quality laminate, it features durable PVC edge detail. OTG office furniture is eco-friendly. 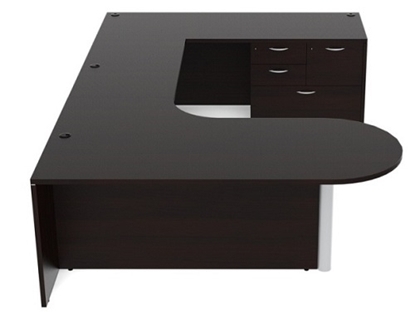 A stylish U shaped office desk from our large offering of Cherryman desks. Features oversized file cabinet for extra storage space, front panel, a 1" thick top with a profiled edge on all four sides for added durability. Available in five stylish colors to fit almost any space. Get free shipping and warranty on all furniture collections. 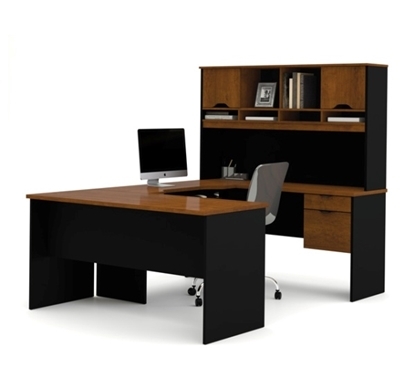 This Offices To Go™ Executive U Shaped Desk with Hutch features a D-Island front. The D-Island provides good top space, allowing you to hold small impromptu meetings. The hutch adds valuable storage space, leaving more space to spread out. This desk is eco friendly GreenGuard® certified. Free shipping and warranty available on all discount office furniture. 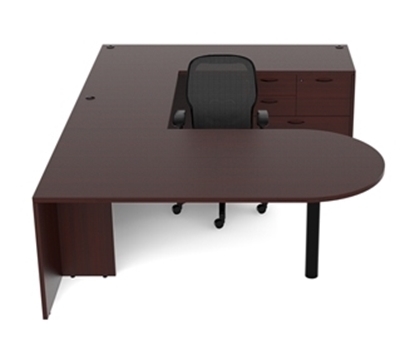 A large 72"W U-Shaped desk that can be used at the home or in the office. This desk features grommet cutouts for wire management, a sturdy metal frame, and open end panels to make your work area seem open and spacious. Designed with elements to create a modern and refined work environment,this U-shaped desk features a stylish two-toned design. This desk combines storage space and work surface area making it a great addition to any home or commercial office. The Bestar Embassy U shaped desk with hutch is a great addition to your office or as home office desks. Perfect for a business or home workspace. Stylish moldings, thermofused melamine finish, designer handles, ball-bearing slides, are some of the great features offered in the Embassy Collection. 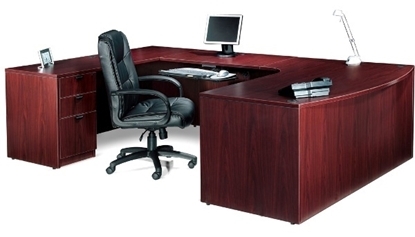 Free shipping and warranty on all discount office furniture. The Bestar Manhattan is an innovative designed, functional, and rich colored U shaped desk with hutch from our large collection of computer desks. The Manhattan will complement any home or business where additional surface space is needed. Free shipping and warranty available on all office furniture. Warm and elegant, the Embassy Collection U shaped Desk with Hutch provides plenty of work surface space and excellent storage capacity. It works well in your commercial or home office. 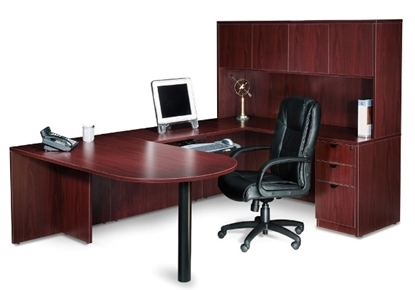 This desk is very modular and is part of an extensive series of high quality office furniture. A great addition to any office, this Bow Front U-Shaped Desk features two pedestals for all your storage needs, a 1" thick work surface, and is available in 5 finish colors. 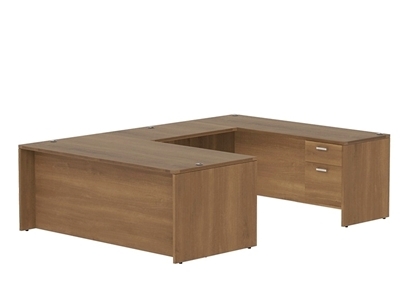 A stylish U shaped desk from our large offering of office desks. The Amber by Cherryman features a 1" thick top with a profiled edge on all four sides and is available in 5 stylish colors. Get free shipping and warranty on all office furniture collections.